Without any doubt, almost everyone loves fashion. Be it a man or women, old or young, fashion attracts everyone. Fashion is incomplete without accessories. Key rings, wrist watches, earrings, glasses, and hats are some of the examples of fashion accessories that people like to carry as they add sparkle to their appearance. Among a plethora of fashion accessories, key rings can be termed as the most useful item as they not only add to the style but are also an important utility for us. Keyrings come in different styles and designs. Get the stylish crystal glass key rings from the Giftwrap to organize your keys in a style. The polished nickel and crystal formation gives it a unique and attractive look. 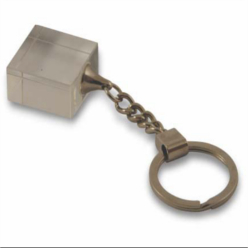 Choosing proper accessories gives you a good chance to leave good impressions to others and these crystal keyrings are specifically designed for this. Among the very fashionable keyrings available in the market, get the best crystal style key rings from Giftwrap and enhance your style statement. Organize keys that important to you like keys to your vehicles, office, and apartments with this crystal style key ring and define your style statement.